GERMANY: Up-to-date coverage from the WindEnergy Hamburg exhibition and WindEurope Summit as the industry descends on Germany. Please refresh this page to stay up-to-date with the latest from WindEnergy Hamburg. 16:53: GE has followed Siemens' example by announcing extensions to its 3MW platform range In Hamburg. The new models are the 3.6-137 and 3.8-130, aimed for IEC ll and IEC lll sites, with a variety of towers for hub heights of 85 to 164.5 metres. 15.57: Heinrik Stiesdal, former CTO of Siemens, has been providing some of the background thinking behind the thermal storage system the company unveiled yesterday. He pointed out that although wind provided 42% of Denmark’s electricity across the whole of 2015, it had contributed only 5% in the past two weeks (September 2016). "We need to store energy not just for hours, but for days," he said. Stiesdal argued that high-temperature thermal energy storage (HI-TES) breaks even on costs with lithium-ion at 10-12 hours, but gets much cheaper beyond that. Discharge of the stored electricity can provide all types of ancillary services, including voltage and frequency regulation, and spinning reserve. "We’ve heard all the arguments against renewables. Most of them can be rebutted," he said. "But there is one that sticks. Wind power is intermittent. Our industry needs a simple answer to that problem because politicians need simple answers." 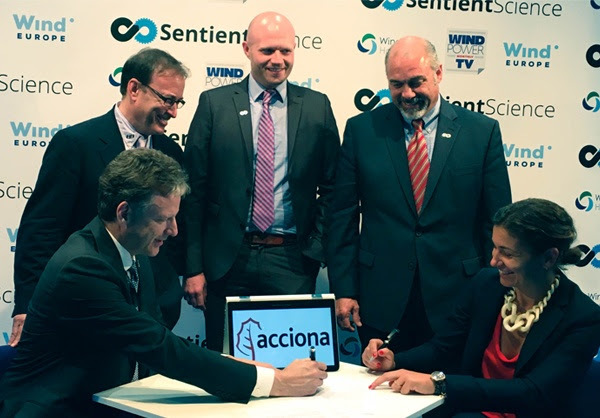 15.24: Developer Acciona and Sentient Science have reached an agreement to provide life extension services to Acciona's entire fleet of wind turbines. 15.19: Copenhagen Infrastructure Partners, through itsCopenhagen Infrastructure II fund, has partnered with the Canadian-based developer Beothuk Energy to develop the 180MW St Georges Bay Project off the coast of Newfoundland. 15.06: German firm Wikov show off their flexible pin epicyclic carrier for 7MW offshore wind turbine gearbox. 14.32: GE has announced the completion of the 51MW first phase of the Aspari wind project in Andhra Pradesh, south-east India. Developed by Mytrah Energy, the project's next two phases will take capacity up to 200MW with power generated by a combination of 1.7MW and 2.3MW GE turbines. 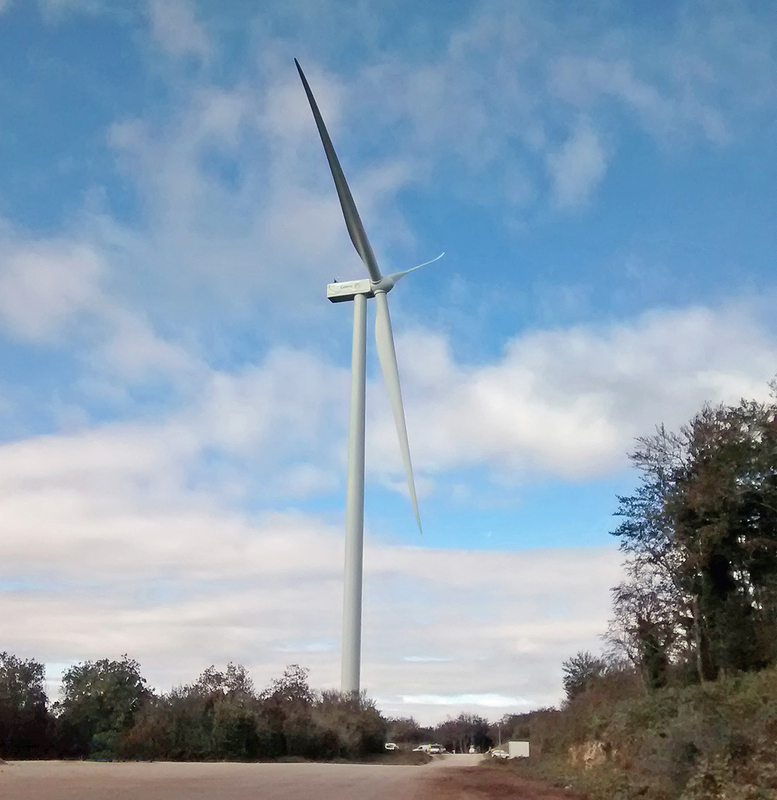 12.31: Gamesa has completed installation of its G126-2.5MW and G132-3.3MW prototype turbines at its Alaiz R&D facility, in northern Spain. 11.50: More new product announcements from Siemens, which is having a very busy show. Three new onshore direct-drive turbines, all based on one platform, have been unveiled: the SWT-3.15-142, aimed at the low-wind speed sector; the SWT-3.3-130LN, targeted at low-to-medium winds and low noise requirements (see below), and the SWT-3.6-130 for IEC Class II sites. The SWT-3.3-130LN and SWT-3.6-130 will go into serial production early next year, with the SWT-3.15-142 following in late 2017. 10.50: Siemens has revealed details of its latest offering for the low-noise, low-to-medium wind speed sector. The SWT-3.3-130LN operates at a reduced rotor speed compared to the SWT-3.3-130, and features the new DinoTail aerodynamic add-ons for the B63 blades (see yesterday's blog). Siemens claims that at 104.9dB, noise emissions are 2dB down on those of sister models. 10.30: One of the show's bigger exhibits — Winergy's gearbox for the Adwen AD 8-180 offshore turbine, has been attracting plenty of attention. 10.15: Developer Mainstream and GE's financial services division have announced the signing of a term sheet to build and operate wind projects in Vietnam. In May, GE and Vietnam's trade and industry ministry signed an agreement to accelerate large-scale wind development. The country has only 151MW of wind capacity today, but the agreement envisaged up to 1GW by 2020. 09.13: This morning, Siemens has won and maintenance contract for the 400MW Veja Mate offshore wind project. Siemens will be responisble for maintaining the offshore substation and turbine structures for the project in the German North Sea for five years. This follows Siemens initial maintenance contract to service the 67 6MW turbines set to be installed there, with completion in 2017. The project is being developed by Veja Mate Offshore Project GmbH, a consortium comprising the Highland Group Holdings, Copenhagen Infrastructure II and Siemens Financial Services (SFS). German manufacturer Senvion has won a contract to supply turbines to the 203MW Trianel Borkum II project in the North Sea. A total of 32 6.2MW turbines will be installed at the site, 45km off the German coast. "We appreciate the confidence that the project-consortium Trianel shows in our turbines. This contract confirms that we are setting standards in the cost-effective generation of offshore wind energy and we will further consolidate our strong position in the offshore wind-energy market with the Senvion 6.2M152," said Senvion CEO Jurgen Geissinger. A final investment decision is expected in 2017, with a proposed construction date of 2018. 09.05: Good morning and welcome to day two of the WindEnergy Hamburg and WindEurope Summit taking place in northern Germany this week. You can catch up with the action from yesterday on our day one live blog or visit the home page to see news and interviews from Windpower Monthly TV, in association with Sentient Science.